Using Intune app protection policies, you can configure settings to block end users from accessing a corporate app or account. These settings target data relocation and access requirements set by your organization for things like jail-broken devices and minimum OS versions. You can explicitly choose to wipe your company’s corporate data from the end user’s device as an action to take for non-compliance by using these settings. For some settings, you will be able to configure multiple actions, such as block access and wipe data based on different specified values. Select All services > Intune. Intune is located in the Monitoring + Management section. 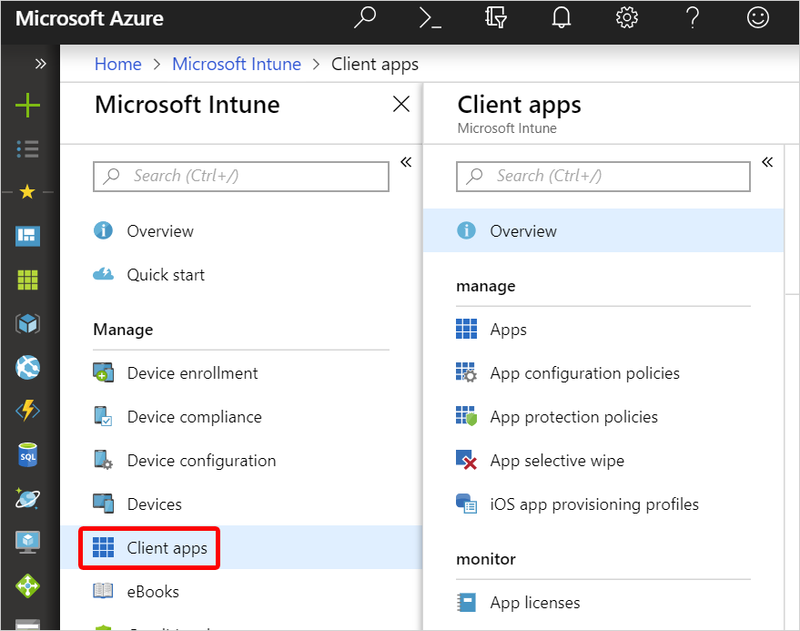 In the Intune pane, select Client apps > App protection Policies. Click Add a policy (You can also edit an existing policy). Click Configure required settings to see the list of settings available to be configured for the policy. By scrolling down in the Settings pane, you will see a section titled Access Actions with an editable table. Select a Setting and enter the Value that users must meet to sign in to your company app. Select the Action you want to take if users do not meet your requirements. In some cases, multiple actions can be configured for a single setting. For more information, see How to create and assign app protection policies. To use the Device model(s) or Device manufacturer(s) setting, input a semi-colon separated list of model identifiers. Avoid spaces in lists of multiple values. These values are not case sensitive. The app protection policy settings table has columns for Setting, Value, and Action. To use the Device model(s) setting, input a semi-colon separated list of iOS model identifiers. You can find an iOS model identifier under the Device Type column in HockeyApp's support documentation. On end-user devices, the Intune client would take action based on a simple matching of device model strings specified in Intune for Application Protection Policies. Matching depends entirely on what the device reports. You (the IT administrator) are encouraged to ensure that the intended behavior occurs by testing this setting based on a variety of device manufacturers and models, and targeted to a small user group. The default value is Not configured. What happens if the IT admin inputs a different list of iOS model identifier(s) between policies targeted to the same apps for the same Intune user? When conflicts arise between two app protection policies for configured values, Intune typically takes the most restrictive approach. Thus, the resultant policy sent down to the targeted app being opened by the targeted Intune user would be an intersection of the listed iOS model identifier(s) in Policy A and Policy B targeted to the same app/user combination. For example, Policy A specifies "iPhone5,2;iPhone5,3", while Policy B specifies "iPhone5,3", the resultant policy that the Intune user targeted by both Policy A and Policy B will be "iPhone5,3". To use the Device manufacturer(s) setting, input a semi-colon separated list of Android manufacturers. You can find the Android manufacturer of a device under the device settings. On end-user devices, the Intune client would take action based on a simple matching of device model strings specified in Intune for Application Protection Policies. Matching depends entirely on what the device reports. You (the IT administrator) are encouraged ensure that the intended behavior occurs by testing this setting based on a variety of device manufacturers and models, and targeted to a small user group. The default value is Not configured. What happens if the IT admin inputs a different list of Android manufacturer(s) between policies targeted to the same apps for the same Intune user? When conflicts arise between two app protection policies for configured values, Intune typically takes the most restrictive approach. Thus, the resultant policy sent down to the targeted app being opened by the targeted Intune user would be an intersection of the listed Android manufacturers in Policy A and Policy B targeted to the same app/user combination. For example, Policy A specifies "Google;Samsung", while Policy B specifies "Google", the resultant policy that the Intune user targeted by both Policy A and Policy B will be "Google". By default, the table will have populated rows as settings configured for Offline grace period, and Max PIN attempts, if the Require PIN for access setting is set to Yes. To configure a setting, select a setting from the dropdown under the Setting column. Once a setting is selected, the editable text box will become enabled under the Value column in the same row, if a value is required to be set. Also, the dropdown will become enabled under the Action column with the set of conditional launch actions applicable to the setting. Block access – Block the end user from accessing the corporate app. Wipe data – Wipe the corporate data from the end user’s device. Warn – Provide dialog to end user as a warning message. In some cases, such as the Min OS version setting, you can configure the setting to perform all applicable actions based on different version numbers. Once a setting is fully configured, the row will appear in a read-only view and be available to be edited at any time. In addition, the row will appear to have a dropdown available for selection in the Setting column. Settings that have already been configured and do not allow multiple actions will not be available for selection in the dropdown.